A high-end product that delivers in style can best sum up Fleer's 2004 E-X MLB release. Fleer has revolutionized the already innovative E-X brand with unique looks, high-tech packaging and a set collectors will clamor for this season! "We have added elements that will take E-X from a great product to a legendary product," said Fleer spokesman Joshua Perlman. "With one of the best autograph line-ups we have offered, along with unparalleled technology, E-X MLB could be the baseball set of the year." Breaking down the autographs even further here is a sneak peak of what you can expect to find. Look for Check Mates featuring two-cut signatures per card. Some cards found in the set feature combinations such as Tom Seaver/Nolan Ryan, Reggie Jackson/Don Mattingly, Cal Ripken Jr./Ozzie Smith, Honus Wagner/Ty Cobb and even Babe Ruth/Lou Gehrig. Also look for Clearly Authentics Emerald Signatures showcasing one of one MLB Logo Patches! These gems have been signed by MLB stars, including Mark Prior, Mike Piazza, Albert Pujols, Jim Thome and Roger Clemens. All Clearly Authentics autographed and game-used cards are printed on stunning clear plastic. 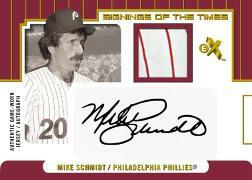 Continuing with the star-studded E-X autograph line-up is Signings of Times, which include autographs and game-used swatches from the game's legends - Don Mattingly, Mike Schmidt, Stan Musial, Rickey Henderson and Yogi Berra are just a few. Along with Autographs, look for significant game-used memorabilia hits such as Double Barrel, which feature dual bat barrel cards. Find Ted Williams/Carl Yastrzemski, Don Mattingly/Reggie Jackson, Roberto Clemente/Orlando Cepada and Kaz Matsui/Hideki Matsui. Other game-worn elements include Clearly Authentics Dual MLB Logo cards numbered one of one. Look for 30 different marquee match-ups such as Kerry Wood/Mark Prior, Hideo Nomo/Hideki Matsui, Albert Pujols/Scott Rolen and Roger Clemens/Randy Johnson. These are just some of the great elements that can be found in 2004 Fleer E-X MLB. The set also includes more autograph and game-used elements, along with rookies numbered to 500. 2004 Fleer E-X MLB will release on August 30, 2004. For more information please visit us at www.Fleer.com.